What makes a hot deal even hotter? Have you been out looking for a home for a while now or are you just now getting your feet wet? We have listed the top 3 qualities to look for in a "Hot Deal" Home! 1. Excellent Condition - When we say excellent we actually mean loved. When a Home Seller truly loves their home they show massive pride of ownership. When something breaks, they fix it, when something is dirty, they wash it. Everything from the front porch to the back fence is cared for and paid attention to. You can assure that you are buying a good home when the Sellers show this much care to their home. 2. The Home is priced at or slightly below Market Value. These homes are priced to ac tually sell and not just sit. So if you have run across a home that is priced fairly, you can almost be certain that it will go fast. 3. This one is a "Two For" - We are talking Location and Available to Show! Most buyers come to us with a certain neighborhood or location in mind. The homes that are close to Good Schools, parks, general services usually go fast than homes that are more rural and a longer drive to you daily destination. 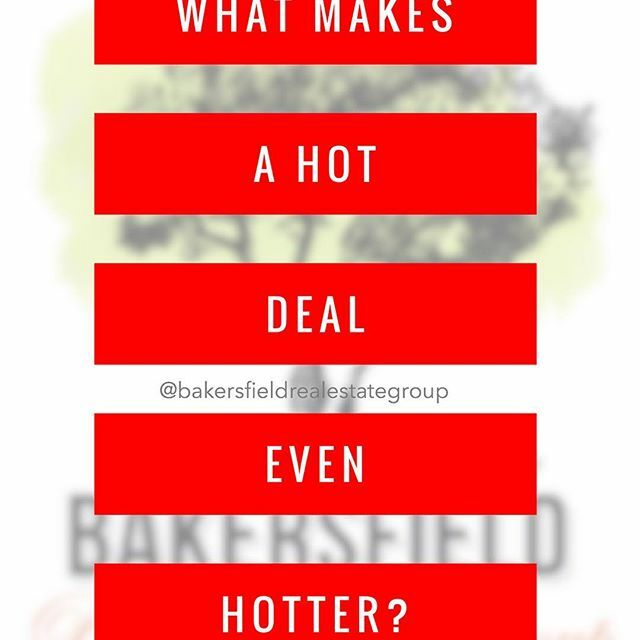 I mean don't get me wrong, we do have some neighborhood is Bakersfield that are in the outskirts that offer that exclusivity, gates and private lakes. Those features in themselves are highly sought after and just as important as location. In these cases, these homes are lumped in with the "Hot Deal" list! - And here is our bonus.. A Home can have all of these features and qualities but if the Seller is not willing to show the home and only offer small windows for showings then no one, including you, will be able to see it. When you have all of the above qualities in a home and a Seller that welcomes super easy showings ( Accompanies by your Realtor), we will bet that the home will go fast and who ever wins this home will be getting a HOT DEAL! We have had the pleasure of finding homes like this for our buyers and I will tell you what.. it is the best feeling in the world. It takes an experienced Real Estate Agent to find a home like this for a buyer. When you are out Searching for a home, make sure you Real Estate has their Hot Deal Goggles on! They are out there!